Great Pyramid of Giza, Hanging Gardens of Babylon, Temple of Artemis, Statue of Zeus at Olympia, Mausoleum of Maussollos, Colossus of Rhodes and the Lighthouse of Alexandria - of the original Seven Wonders of the World, only one remains. 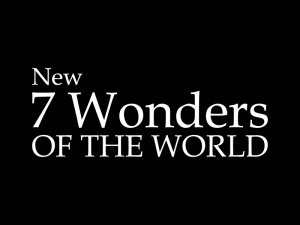 No doubt prompted by this fact, adventurer/businessman Bernard Weber started a global campaign for a new list of World Wonders. The campaign, which started in September 1999, invites everyone in the world to vote for their favorite monuments via the internet. The final list will be announced on July 7, 2007 (7-7-07) with polls closing the day before. Organizers say 50 million votes have been cast so far, with a large majority coming from Asian and Latin American countries, possibly do to their under representation in the original list of seven. Currently, The Great Wall, the Colosseum and Machu Picchu have the most votes, with Greece’s Acropolis, Chichen Itza, the Eiffel Tower, Easter Island, Rio de Janeiro’s Christ the Redeemer, the Taj Majal and Jordan’s city of Petra rounding out the top 10. Angkor Wat is already included in CyArk’s database, and a few of the other locations listed are currently lined up as potential projects.